"Stan the Man" redirects here. For other people of the same nickname, see Stan the Man (disambiguation). For other uses, see Stan Musial (disambiguation). Stanley Frank "Stan" Musial (/ˈmjuːziəl/ or /ˈmjuːʒəl/; born Stanisław Franciszek Musiał; November 21, 1920 – January 19, 2013), nicknamed "Stan the Man", was an American Major League Baseball (MLB) outfielder and first baseman. He spent 22 seasons playing for the St. Louis Cardinals, from 1941 to 1944 and 1946 to 1963. Widely considered to be one of the greatest and most consistent hitters in baseball history, Musial was a first-ballot inductee into the Baseball Hall of Fame in 1969, and was also selected to the St. Louis Cardinals Hall of Fame in the inaugural class of 2014. Musial was born in Donora, Pennsylvania, where he frequently played baseball, whether informally or in organized settings, eventually playing on the baseball team at Donora High School. Signed to a professional contract by the St. Louis Cardinals as a pitcher in 1938, Musial was converted into an outfielder prior to his major league debut in 1941. Noted for his unique batting stance, he quickly established himself as a consistent and productive hitter. In his first full season, 1942, the Cardinals won the World Series. The following year, he led the NL in six different offensive categories and earned his first MVP award. He was also named to the NL All-Star squad for the first time; he appeared in every All-Star game in every subsequent season he played. Musial won his second World Series championship in 1944, then missed the entire 1945 season while serving with the Navy. When he returned to baseball in 1946, Musial resumed his consistent hitting. That year he earned his second MVP award and third World Series title. His third MVP award came in 1948, when he finished one home run shy of winning baseball's Triple Crown. After struggling offensively in 1959, Musial used a personal trainer to help maintain his productivity until he decided to retire in 1963. At the time of his retirement, he held or shared 17 major league records, 29 National League records, and nine All-Star Game records. Ironically, in 1964, the season following his retirement, the Cardinals went on to defeat the New York Yankees in an epic 7-game clash, for St. Louis' first World Series championship in nearly two decades (a team which included future Hall of Famer Lou Brock performing what would have likely been Musial's left field duties). In addition to overseeing businesses, such as a restaurant both before and after his playing career, Musial served as the Cardinals' general manager in 1967, winning the pennant and World Series, then quitting that position. He also became noted for his harmonica playing, a skill he acquired during his playing career. Known for his modesty and sportsmanship, Musial was selected for the Major League Baseball All-Century Team in 1999. In February 2011, President Barack Obama presented Musial with the Presidential Medal of Freedom, one of the highest civilian awards that can be bestowed on a person by the United States government. Musial was born in Donora, Pennsylvania, the fifth of the six children (four girls and two boys) of Lukasz and Mary (Lancos) Musiał (/ˈmuːʃaʊ/, MOO-show). His mother was of Carpatho-Rusyn descent and his father was a Polish immigrant who chose the name Stanisław Franciszek for his first son, though his father always referred to Musial using the Polish nickname Stasiu, pronounced "Stashu". Musial frequently played baseball with his brother Ed and other friends during his childhood, and considered Lefty Grove his favorite ballplayer. Musial also had the benefit of learning about baseball from his neighbor Joe Barbao, a former minor league pitcher. When he enrolled in school, his name was formally changed to Stanley Frank Musial. At age 15 Musial joined the Donora Zincs, a semi-professional team managed by Barbao. In his Zincs debut he pitched 6 innings and struck out 13 batters, all of them adults. Musial also played one season on the newly revived Donora High School baseball team, where one of his teammates was Buddy Griffey, father of MLB player Ken Griffey, Sr. and grandfather to Ken Griffey, Jr. Baseball statistician Bill James described the younger Griffey, in comparison to Musial, as "the second-best left-handed hitting, left-handed throwing outfielder ever born in Donora, Pennsylvania, on November 21." His exploits as a rising player in Pennsylvania earned him the nickname "The Donora Greyhound". Musial also played basketball, for which he was offered a scholarship by the University of Pittsburgh. Meanwhile, the St. Louis Cardinals had scouted Musial as a pitcher and, in 1937, offered him a professional contract after a workout with their Class D Penn State League affiliate. Musial's father initially resisted the idea of his son pursuing a baseball career, but reluctantly gave his consent after lobbying by both Musial and his mother. Musial also credited his school librarian Helen Kloz for pointing out that baseball was his dream and advising him to pursue it professionally. In what was then a common practice, the Cardinals did not file the contract with the baseball commissioner's office until June 1938. This preserved Musial's amateur eligibility, and he was still able to participate in high school sports, leading Donora High School's basketball team to a playoff appearance. He then reported to the Cardinals' Class D affiliate in West Virginia, the Williamson Red Birds. Musial's rookie year with Williamson in 1938 was a period of adjustment both on and off the field. He began gaining more in-depth knowledge about baseball strategy while posting a 6–6 win–loss record and a 4.66 earned run average (ERA), to go along with a .258 batting average. Off the field he confronted feelings of homesickness, while learning to live comfortably and independently on his $65-per-month salary. Musial finished his high school education before returning to Williamson in spring 1939. That season his numbers improved to a 9–2 record, a 4.30 ERA, and a .352 batting average. The Cardinals played the American League champion New York Yankees in the 1942 World Series. Representing the winning run in the bottom of the ninth inning of Game 1 at Sportsman's Park, Musial grounded out with the bases loaded to seal a Yankees victory. Musial's first hit of the Series was an RBI single that provided the margin of victory in Game 2, allowing the Cardinals to tie the Series. Over the next three games at Yankee Stadium, Musial had three more hits as the Cardinals defeated the Yankees in the Series four games to one. Musial batted .222 for the Series, with two runs scored. "Every time Stan came up they chanted, 'Here comes the man!'" It was also during the 1946 season that Musial acquired his nickname of "The Man". During the June 23 game against the Dodgers at Ebbets Field, St. Louis Post-Dispatch sportswriter Bob Broeg heard Dodger fans chanting whenever Musial came to bat, but could not understand the words. Later that day over dinner, Broeg asked Cardinals traveling secretary Leo Ward if he had understood what the Dodger fans had been chanting. Ward said, "Every time Stan came up they chanted, 'Here comes the man!'" "'That man,' you mean", Broeg said. "No, the man", replied Ward. Broeg mentioned this story in his Post-Dispatch column, and Musial was thereafter known as Stan "The Man". "He missed tying for the top in homers by one rained out home run. If it had counted, he would have won the Triple Crown that year...and in addition have been the only player of this century to lead the league in runs, hits, double, triples, and slugging percentage. What a year!" Musial finished 1948 leading the major leagues in batting average (.376), hits (230), doubles (46), triples (18), total bases (429), and slugging percentage (.702). Winning the NL batting title by a 43-point margin, with an on-base percentage lead of 27 points and a 138-point slugging percentage margin—the latter being the largest gap since Rogers Hornsby's 1925 season—Musial became the first player to win three NL MVP awards. If a home run he hit during a rained out game had been counted in his season totals, he would have won the Triple Crown by leading the NL in batting average, home runs, and runs batted in. "No man has ever been a perfect ballplayer. Stan Musial, however, is the closest to being perfect in the game today.... He plays as hard when his club is away out in front of a game as he does when they're just a run or two behind." Musial accomplished another historical feat on May 2, 1954, in a doubleheader in St. Louis against the New York Giants: he hit three home runs in the first contest, then added two more in the second to become the first major leaguer to hit five home runs in a doubleheader. In addition to his five home runs, he also hit a single in the first game, setting a new record of 21 total bases for a doubleheader. The only player besides Musial to hit five home runs in a doubleheader is Nate Colbert, who achieved the feat in 1972. "Line drive! Into left field! Hit number three thousand! A run has scored! Musial around first, on his way to second with a double. Holy Cow! He came through!" On June 30, 1959, Musial was the batter in one of baseball history's oddest plays. In a game between the Cardinals and Chicago Cubs, he was at the plate with a count of 3–1. Bob Anderson's next pitch was errant, evading catcher Sammy Taylor and rolling all the way to the backstop. Umpire Vic Delmore called ball four, even as Anderson and Taylor contended that Musial had foul tipped the ball. Because the ball was still in play and Delmore was embroiled in an argument with the catcher and pitcher, Musial kept running in attempt to make second base. Seeing that Musial was trying for second, Alvin Dark ran to the backstop to retrieve the ball. The ball wound up in the hands of field announcer Pat Pieper, but Dark ended up getting it back anyway. Absentmindedly, however, Delmore pulled out a new ball and gave it to Taylor. Anderson finally noticed that Musial was trying for second, took the new ball, and threw it to second baseman Tony Taylor. Anderson's throw flew over Taylor's head into the outfield. Dark, at the same time that Anderson threw the new ball, threw the original ball to shortstop Ernie Banks. Musial did not see Dark's throw and only noticed Anderson's ball fly over the second baseman's head, so he tried to go to third base. On his way there, he was tagged by Banks, and after a delay he was ruled out. Based on his 1959 performance, Musial accepted a pay cut in 1960 from his previous $100,000 salary to $80,000. Eager to prove his mediocre performance was the result of improper physical conditioning, he enlisted the help of Walter Eberhardt, Saint Louis University's director of physical education. In June 1960, newspaper articles began speculating that Musial would soon retire, yet he finished the season with a .275 batting average. He addressed the speculation in September, confirming that he would play again in 1961. His .288 batting average that season reaffirmed his decision. In 1962, Musial posted a .330 batting average, good for third in the batting race, with 19 homers and 82 RBI. As a pinch-hitter, he had 14 base hits in 19 at-bats (.615). Along the way, he established new NL career marks for hits, RBI, and runs scored. That same year, on July 8, the 41-year-old Musial became the oldest player ever to hit three home runs in one game. The Cardinals began 1963 by winning 10 of their first 15 games, as Musial posted a .237 batting average. He set a new major league record for career extra-base hits on May 8 and improved his batting average to .277 by the end of the month. Making his 20th All-Star appearance and 24th All-Star Game appearance on July 9, 1963, he pinch-hit in the fifth inning. Asked by general manager Bing Devine on July 26 what his plans were, Musial decided to retire at season's end. He waited until the Cardinals team picnic on August 12 to publicly announce his decision, hopeful he could retire on a winning note. Musial became a grandfather for the first time in the early hours of September 10; later that day, he hit a home run in his first at-bat. After sweeping a doubleheader on September 15, the Cardinals had won 19 of their last 20 games, and were one game behind the Los Angeles Dodgers. The Dodgers then swept the Cardinals in a three-game series in St. Louis and clinched the NL pennant on September 25. Musial's last game, on September 29, 1963, was preceded by an hour-long retirement ceremony. Speakers at the event included baseball commissioner Ford Frick, Cardinals broadcaster Harry Caray, and Cardinals owner Gussie Busch, who announced that Musial's uniform number "6" would be retired by the team. During the game, Musial recorded a single in the fourth inning, then hit a single to right field that scored teammate Curt Flood in the sixth. Cardinals manager Johnny Keane brought in Gary Kolb as a pinch-runner for Musial, bringing his major league career to an end. Just as he had recorded two base hits in his major league debut, Musial finished his last game with two hits, as well. Musial finished with the all-time National League record and second to only Ty Cobb on the all-time Major League list. Musial's last hit in his career was hit past the Cincinnati Reds second baseman at the time, Pete Rose, who later broke Cobb's record to become the all-time hit king. "All Musial represents is more than two decades of sustained excellence and complete decency as a human being." At the time of his retirement, Musial held or shared 17 major league records, 29 NL records, and nine All-Star Game records. Among those records, he ranked as the major league career leader in extra-base hits (1,377) and total bases (6,134). He also held NL career marks in categories such as hits (3,630), games played (3,026), doubles (725), and RBI (1,951). He finished his career with 475 home runs despite never having led the NL in the category. Jerry Lansche speculates Musial would likely have become the second player, after Babe Ruth, with 2,000 RBI, and would have exceeded 500 career home runs had he not served in the military. His lowest full season RBI output before the war was 72 (in 1942) and as he needed only 49 RBI to reach 2,000 for his full career, he certainly would have exceeded 2,000 RBI by playing without injury in 1945. His home run production is a different story and it is highly unlikely he would have reached 500. He did not hit more than 13 home runs in any season before he entered the navy and did not hit as many as 25 (the number he would have needed to become a 500 career homer club member) until 1948, 3 years after returning to baseball from World War II. His career hit total was evenly split between 1,815 hits at home and 1,815 hits on the road. Steven R. Bullock speculates that it is possible that without military service Musial might have continued playing to attempt to exceed Ty Cobb's career hit record of 4,191. Even if Musial had hit safely 207 times (the average of his hits in the 2 years before and the 2 years after his service in the navy) in 1945, he still would have been 354 hits short of tying Ty. His hit total in his last season at age 43 was only 86; even if he could have had 103 hits a season (the average of his last 5 seasons) he would have had to play to age 47 to attain the hits record. He was the first major league player to appear in more than 1,000 games at two different positions, registering 1,896 games in the outfield and 1,016 at first base. Since Musial's retirement in 1963, the only player to finish his career with a higher lifetime batting average has been Tony Gwynn. Hank Aaron has been the only player to surpass his record of 6,134 total bases. Musial was noted for his harmonica playing, including his rendition of "Take Me Out to the Ball Game". Through the 1990s, he frequently played the harmonica at public gatherings, such as the annual Baseball Hall of Fame induction ceremony and various charity events. He performed on the television show Hee Haw and in 1994 recorded 18 songs that were sold in tandem with a harmonica-playing instruction booklet. "Here stands baseball's perfect warrior. Here stands baseball's perfect knight." Musial was elected to the Baseball Hall of Fame in his first year of eligibility in 1969, named on 93.2 percent of the ballots. On June 14, 1973 he was the first inductee into the National Polish-American Hall of Fame, housed at St. Mary's College in Orchard Lake, Michigan. In 1989, he was inducted into the St. Louis Walk of Fame. Five years later, a baseball field was named after him in his hometown of Donora. He was ranked tenth on The Sporting News' list of the 100 Greatest Baseball Players published in 1998. He was also one of the 30 players selected to the Major League Baseball All-Century Team, added by a special committee after he finished 11th in fan voting among outfielders. In 2000, he was inducted into the Hall of Famous Missourians, and a bronze bust depicting him is on permanent display in the rotunda of the Missouri State Capitol. In January, 2014, the Cardinals announced Musial among 22 former players and personnel to be inducted into the St. Louis Cardinals Hall of Fame Museum for the inaugural class of 2014. Upon hearing the news of his death, fans gathered and began an impromptu memorial by his statue outside Busch Stadium; the Cardinals issued a release saying the memorial would be left in place for some time. In a laudatory obituary, The New York Times quoted famed New York manager Leo Durocher: "There is only one way to pitch to Musial—under the plate." St. Louis Mayor Francis Slay tweeted: "Sad as we are, we are fortunate to have had Stan in STL for so long, and are also glad that Stan and Lil are together again." He ordered flags at half-mast in the city. Thousands of fans braved cold temperatures on January 24 for a public visitation at the Cathedral Basilica of Saint Louis, where Musial lay in state, dressed in his trademark cardinal-red blazer and with a harmonica in his lapel pocket, flanked by a Navy honor guard. A private funeral Mass was held on Saturday, January 26, 2013, at the New Cathedral in St. Louis, televised locally by KTVI and KPLR as well as Fox Sports Midwest on pay-television. New York's Cardinal Timothy Dolan, who in his first episcopal post served as an auxiliary bishop of the Archdiocese of Saint Louis, was the principal celebrant, and Knoxville's Bishop Richard F. Stika, Musial's former parish priest, was the homilist. Bob Costas gave the principal eulogy, calling him "the genuine hero who as the years and decades passed, and disillusionment came from other directions, never once let us down", and quoting fellow Cooperstown honoree Mickey Mantle, who once said that Musial "was a better player than me because he was a better man than me". Following the funeral, Musial's family led a procession from the New Cathedral to Busch Stadium, where they laid a memorial wreath at his statue. Once the wreath was placed and Musial's family began to walk back to their vehicles, the hundreds of Cardinal fans gathered for the wreath ceremony gave both Musial and his family one final salute. That salute was the fans singing "Take Me Out to the Ball Game" before Musial was taken to his final place of rest. Musial was the last living member of the Cardinals team that won the 1942 World Series. At the time of his death, no living players had played on an earlier World Series-winning team. The Stan Musial Veterans Memorial Bridge in St. Louis (carries I‑70) was built in his memorial. As a reflection of his popularity Musial has had infrastructure named after him. In May 2011 the Pennsylvania State Senate changed the name of the bridge that carries the C. Vance Deicas Memorial Highway (S.R. 1077) over the Monongahela River from Donora-Monessen Bridge to Stan Musial Bridge after Musial who was a native of the area. In October 2013 the St. Louis Fire Department started operating a fireboat named after Musial. In July 2013, the new Interstate 70 bridge over the Mississippi River between Illinois and Missouri at St. Louis received the official name of "Stan Musial Veterans Memorial Bridge"
↑ "Musial, Stanley Frank". Pennsylvania Center for the Book. Retrieved 2013-01-22. ↑ "Reds star hits 500th career home run". ESPN. Associated Press. June 20, 2004. Retrieved February 28, 2009. ↑ "Stan Musial player page". Retrieved March 13, 2011. 1 2 3 Schwartz, Larry (2007). "Musial was gentleman killer". ESPN. Retrieved November 24, 2009. 1 2 Finkel, Jan. "Stan Musial". Society for American Baseball Research. Retrieved April 17, 2009. 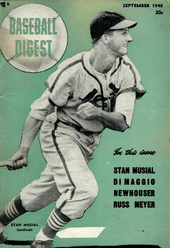 ↑ Meany, Tom, "Baseball's Greatest Hitters: Stan Musial", Baseball Digest, June 1950, p. 64. ↑ "The 1941 Season". Retrosheet.org. Retrieved March 22, 2009. 1 2 3 4 5 6 7 8 9 10 "Stan Musial Statistics". Sports Reference, LLC. Retrieved February 16, 2011. ↑ "Stan Musial". Retrosheet.org. Retrieved February 24, 2009. ↑ "The 1946 St. Louis Cardinals Regular Season Game Log". Retrosheet.org. Retrieved May 31, 2009. ↑ Goold, Derrick (April 2, 2008). "The search for The Man's lost homer". St. Louis Post-Dispatch. Retrieved September 11, 2009. ↑ "That Man". Time. September 5, 1949. Retrieved August 9, 2009. 1 2 Goldstein, Richard (20 January 2013). "Stan Musial, Gentlemanly Slugger and Cardinals' Stan the Man, Dies at 92". The New York Times. Retrieved 23 January 2013. ↑ O'Neil, Paul (December 23, 1957). "For 1957 The Editors of Sports Illustrated Choose Stan Musial". Sports Illustrated. Retrieved December 13, 2009. ↑ "Musial campaigns for Kennedy". ↑ Musial Is First in History Put Out By 2 Baseballs! 1 2 Bullock, Steven R. (2004). Playing for Their Nation: Baseball and the American Military during World War II. University of Nebraska Press. p. 128. ISBN 0-8032-1337-9. ↑ Wiles, Tim (May 18, 2010). "Take Me Out to the Ball Game". National Baseball Hall of Fame and Museum. Retrieved July 9, 2010. 1 2 Timmermann, Tom (January 25, 2013). "Musial put Donora on the map, but town is fading away". St. Louis Post-Dispatch. Retrieved July 25, 2016. ↑ Caple, Jim (July 22, 2016). "Welcome to Donora, Pa.: The unlikely intersection of The Kid and Stan The Man". ESPN.com. Retrieved July 24, 2016. ↑ Langosch, Jenifer (May 4, 2012). "Lilian Musial: The Woman behind The Man". MLB.com. Retrieved May 4, 2012. Roberts, Quinn (May 3, 2012). "Stan Musial's Wife, Lillian, Dies at 91". MLB.com. Retrieved May 4, 2012. ↑ "St. Louis Walk of Fame – Stan Musial". St. Louis Walk of Fame. Retrieved December 13, 2009. ↑ "The All-Century Team". MLB.com. 1999. Retrieved March 3, 2009. ↑ "Hall of Famous Missourians". Missouri House of Representatives. Retrieved November 24, 2009. ↑ "Q & A: Baseball Guru Bill James". Time Inc. March 6, 2008. Retrieved July 9, 2010. ↑ Merron, Jeff (2007). "The List: Underrated all-time athletes". ESPN. Retrieved February 28, 2009. ↑ Leach, Matthew (July 14, 2009). "Musial part of special moment at Classic: Cards' great hands ball to Obama after entering field on cart". MLB.com. Retrieved July 15, 2009. ↑ Hurwitz, Lee (May 18, 2008). "Musial honored before Rays finale: Hall of Famer memorialized with statue at Busch Stadium". MLB.com. Retrieved February 25, 2009. ↑ "St. Louis Cardinals Stand for Stan". MLB Advanced Media. Retrieved May 30, 2009. ↑ Fallstrom, R.B. (January 20, 2013). "Cardinals Hall of Famer Stan Musial Dies at Age 92". ABC News. Archived from the original on January 23, 2013. Retrieved January 19, 2015. ↑ "Career Leaders & Records for WAR – Position Players". Retrieved January 19, 2015. ↑ "Career WAR Leaderboard – Batters". Retrieved January 19, 2015. ↑ Noble, Marty (January 19, 2013). "Beloved Hall of Famer Musial dies at 92". MLB.com. ↑ Hummel, Rick (January 20, 2013). "STAN 'THE MAN' MUSIAL DIES: NO. 6 WAS GREATEST CARDINAL". St. Louis Post-Dispatch. ↑ "Stan Musial dead at 92; greatest Cardinal player ever". St. Louis Post-Dispatch. January 20, 2013. ↑ Rau, Emily (2013-01-19). "Crowds gather at Musial's statue, pay tribute to 'The Man'". KMOV.com News 4. Retrieved 2013-01-20. ↑ Goldstein, Richard (2013-01-19). "Stan Musial, One of the Game's Greatest Hitters, Dies at 92". The New York Times. Retrieved 2013-01-20. ↑ "Statement from Gov. Nixon on passing of Stan Musial". Office of Missouri Governor Jay Nixon. Retrieved 2013-01-22. ↑ "MayorSlay.com (@MayorSlay) on Twitter". Twitter.com. 2013-01-20. Retrieved 2013-01-22. ↑ "Tributes pour out for 'Stan The Man'". MLB Advanced Media. 2012-06-19. Retrieved 2013-01-22. ↑ McDonnell, Wayne G., Jr (January 26, 2013). "A Final Heartfelt Tribute for 'Stan the Man'". Forbes. Retrieved January 27, 2013. ↑ "Senate Passes Bill Naming Local Bridge for 'Stan the Man' Musial". Office of Tim Solobay. 2011-05-24. ↑ Brett Blume (2012-05-24). "New Rescue Boats To Patrol St. Louis Riverfront". CBS News. Archived from the original on 2012-06-03. Retrieved 2013-09-30. St. Louis fire officials say they'll be more prepared than ever to make timely rescues on the Mississippi River once two new boats arrive. ↑ "'Stan Span' gets Obama approval". St. Louis Post-Dispatch. July 12, 2013. O'Neill, Dan (2005). Smith, Mike, ed. Busch Stadium Moments. St. Louis: The St. Louis Post-Dispatch. ISBN 978-0-9661397-2-3. OCLC 62385897.